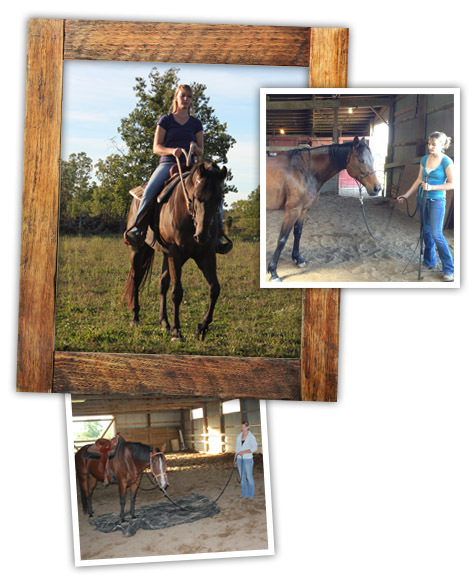 Take the Lead Horsemanship, LLC is proud to offer monthly training in Hilliard, Ohio. Facilities include an indoor arena with dust-free footing, large outdoor arena, and several fields. We offer full and partial training for horses of all ages and breeds. Whether your needs are starting under saddle, preparing a quiet trail mount, tuning-up your horse for show season, re-training a problem horse, or simply getting back in shape, we can help. We feel that a solid foundation is essential. Therefore, all horses, regardless of background, start with a course on groundwork. They learn things such as how to lunge, flex and move, responses to pressure, and basic desensitization. These exercises help to create heightened communication between the horse and handler. Contact us for the list of required annual vaccinations and Coggins testing. An unstarted horse is required to stay with us for a minimum of two months, though we strongly recommend a three-month stay. During this time, your horse will learn a solid groundwork foundation, gaining respect and trust of the handler. Desensitization will be performed with many objects and obstacles training the horse to think, rather than spook. Flexing, one-rein stops, backing with light cues, and standing quietly for every day tasks will be learned. The horse is ridden at the walk, trot, and lope with soft direct cues. After 60-90 days of training, your horse may be considered “broke”. A well mannered, finished horse takes several years of riding. However, Take the Lead strives to give your horse a solid foundation, and give you the knowledge to take him the rest of the way. For the more advanced horse that needs a refresher, all of the same groundwork is applied. The goal for these horses is to have them become soft, supple, and respectful. More advanced work is done with pivoting, sidepassing, and moving forequarters and hindquarters for whatever discipline you prefer. Turnout is available for all horses in training. © 2019 Take the Lead Horsemanship.